The transition from July to August brought vacations and final exams and a LOT to do, so apologies for no previous July edition of Five Quality Tracks. But never fear — after going over the five tracks from August, we’ll double back to July and make up for lost time with five additional tracks. Frank is back! It’s hard to believe this actually happened. I still can’t shake the feeling that we’re all living a fever dream and Frank Ocean’s two new albums (yes, two new albums!) will be yanked away from us when we wake up. 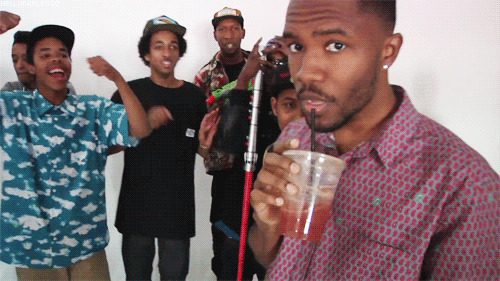 But my iTunes still has 35 more Frank Ocean songs than it did a couple weeks ago, so it’s real! On “Self Control,” Ocean opens with a jarring chipmunk effect on his voice before going into his gorgeous, raw croon over a rhythmic electric guitar groove. Ocean’s ability to create a thick, fully realized atmosphere in the studio is enough to put him in the upper echelon of songwriters, but then he has that extraordinary voice to go on top of it. He’s a talented dude. The song then gives way to an absolutely stunning chorus of Franks singing “I I I know you gotta leave leave leave.” It’s the kind of thing that makes you stop in your tracks and pause to take in the beauty. Frank is back. Let’s enjoy it.